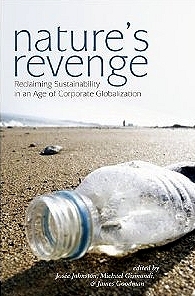 The article by Santiago Jiménez and Barkin appears in a book entitled Nature’s Revenge: Reclaiming Sustainability in an Age of Corporate Globalization (University of Toronto Press/Garamond 2006). This book, which in its own words, “proposes a radical definition of sustainability, reclaiming the word from the rhetoric typically used by corporations and governments to facilitate unrelenting economic growth and the notion of ‘business as usual'”, is well worth reading. Table 2.1 of “Who cares about the Commons” by Josée Johnston. 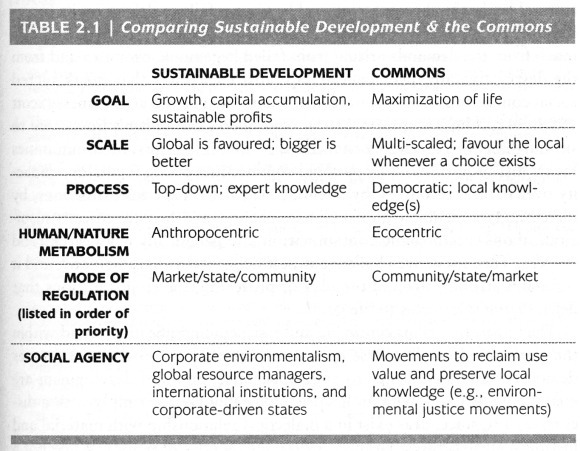 It is an example of this commons-based approach that Santiago Jiménez and Barkin examine in their chapter. They analyze an alternative, locally initiated project, based on the Integrated Development of Natural Resources (Administración Integral de los Recursos Naturales, AIRN), which stands in sharp contrast to Fonatur’s “top-down” development model. The AIRN approach recognizes that local communities have a symbiotic relationship with their surrounding natural environment that is “crucial for mutual survival”. It also recognizes that the community-environment links are dynamic, not static, and will change or evolve with time as the community develops. AIRN proposals aim, essentially, to speed up this development process, helping to find new productive projects for the communities while managing ecosystems effectively and sustainably. The success of AIRN development projects relies on an active participation by the local community to identify issues, opportunities and ways to progress. It is crucial that the local people are equal partners in the decision-making process. In the Huatulco area, the Center for Ecological Support (Centro de Suporte Ecológico, CSE), an NGO, adopted an AIRN approach to devise appropriate strategies to reverse the damage done to water resources by the construction and expansion of Huatulco tourist resort, which had destroyed forest cover, reduced infiltration and abstracted water from the aquifer that underlies the Copalita River. The CSE proposed a reforestation program to actively regenerate (not just protect) the forests throughout the basin, including parts of the Southern Sierra Madre (Sierra Madre del Sur). At the same time, the CSE helped local inhabitants to explore new (alternative) sources of employment and income based in their communities, which offered them a viable option to abandoning their land and accepting menial low-paid jobs in the tourist resort or elsewhere. Santiago Jiménez and Barkin looked at three small villages that had participated in the AIRN proposals made by the CSE: Santa María Xadani, Santa María Petatengo and El Achiote. Each village had participated in different ways, and with varying degrees of success. Close familial ties in Petatengo, for example, ensured more community support than in Xadani where internal divisions reduce social cohesion. El Achiote is a small “rancho” of 14 families, all of whom participated in the reforestation project. The families also combine to carve and paint the colorful Oaxacan whimsical wooden figures known as “alebrijes”. The settlement gained electricity service in 2000 and telephone service in 2001. Sadly, a combination of circumstances led to many local inhabitants migrating away from the area in search of better incomes and the CSE was forced to suspend its operations. The authors point out that development plans have to take account of three very different concepts of time. The local communities in this region view time as somewhat flexible, preferring to make decisions by consensus, rather than in order to meet any deadline. Organizations providing funding for projects see time in terms of deadlines and financial commitments. Local and state governments view time in terms of political cycles, with a project having more chance of success if it is launched early on in an administration’s term. Santiago Jiménez and Barkin also emphasize the importance of projects having an effective mediator (as the CSE proved to be) “capable of balancing the rhythms of Western culture, of nature, and of traditional culture”. Mexico badly needs more examples of successful mediators, particularly where large scale tourism projects are concerned.